Put your love of soccer, teamwork, community, and meeting new people to work! SOPFC's Promo Crew works with our Promotions Coordinator to spread the word about SOPFC and make sure our special events are successful. The ideal crew member will be passionate about soccer, reliable, and responsible. This is an opportunity to have fun, work with other soccer fans, and meet new people! If you're new to Atlanta, we'll introduce you to a great group of folks. To become a Promo Crew member, please fill out our interest form at the bottom of this page. SOPFC is on a mission to grow and unite the soccer community in Atlanta. We are committed to making soccer convenient and accessible for the entire community, by fostering a shared passion for the sport, and providing dedicated active spaces for the game. 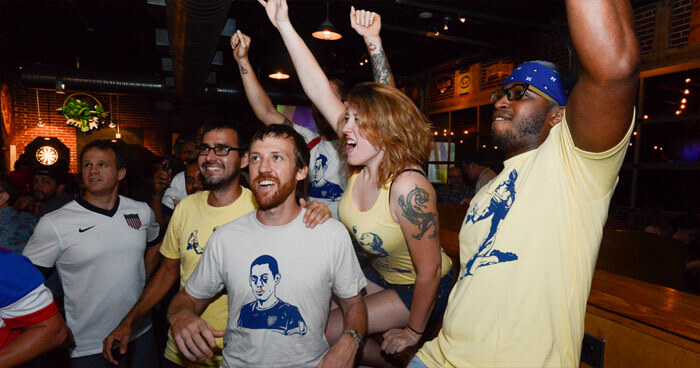 Joining the Promo Crew is an easy way to support a growing soccer movement in Atlanta, get involved with the community, and support an active lifestyle. Plenty of opportunities to grow with the club. As SOPFC continues to expand in the Intown Atlanta area, including new downtown permanent rooftop soccer facility plans underway, we will be filling new operational and management positions. Qualified candidates who have worked with our Promo Crew will receive preference. This is also a great chance to network with soccer and community leaders, both corporate and civic. If you are a student interested in sports, marketing, management, community outreach, or any related field of study, this is a great opportunity to receive internship credit with your school. We will work with your college or university program to establish internship credit for your work. Promo Crew members receive a free SOPFC t-shirt, and free or discounted tickets to soccer games, rooftop tournaments, community events, and more. Members who show up regularly may also receive discounted fees to play in our leagues. Email info@sonsofpitchesfc.com with "Promo Crew" in the subject line and tell us more about yourself, your connection to soccer, and your info and availability. Look forward to hearing from you!